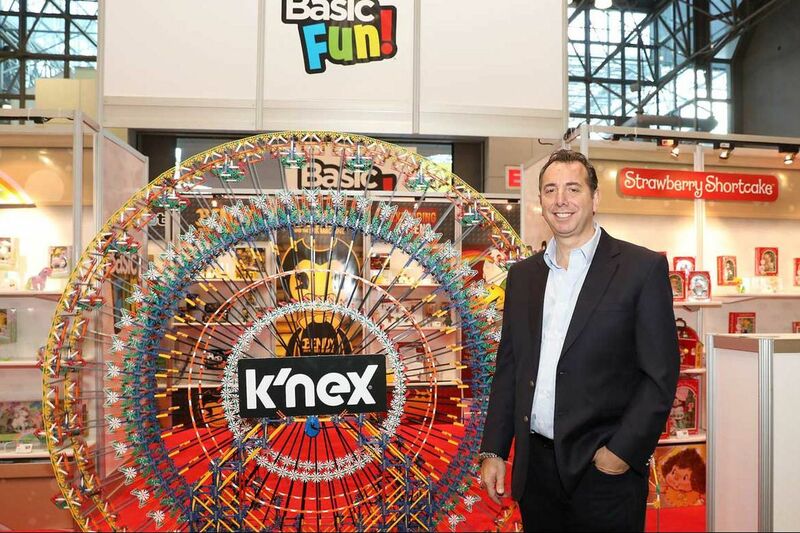 “Jay Foreman, CEO of Basic Fun!, poses with K’NEX products after Basic Fun’s acquisition of the company this year. The firm will be hit by Chinese tariffs if the trade war escalates. A group representing Pennsylvania toy manufacturers, distillers, hog farmers, and retailers gathered in Philadelphia for a town hall meeting on Thursday to sound the alarm on President Trump's escalating trade war with China. Tariffs have destabilized businesses by making it nearly impossible to formulate business strategy, said members of the group, Tariffs Hurt the Heartland, which held a panel on free trade Thursday with funds coming from big agriculture groups, ranchers and individuals. Inventories are being kept low. New small manufacturing facilities have been placed on hold. The state's 101 whiskey distillers and spirit importers are delaying market expansions into Asia and Europe. The toy industry is especially anxious about next year's sales. Industry leaders already anticipate higher production costs and consumer prices. "The good news is that [the hikes] won't be happening this season," said panelist Michael Araten, CEO of the Rodon Group in Hatfield, which specializes in plastic-injection molding in the United States, including the K'nex building toy brand. Next year, the self-described "patriotic capitalist" said, prices may be be 10 percent to 20 percent higher. "A $20 toy will cost $30. The [Trump] tax credits were great," Araten added. "But the tariffs will take all those gains away from the consumer." Minyuan Zhao, associate professor of management at the Wharton School, said "the biggest threat to all involved is that they don't know how to plan ahead." Determining the impact across the spectrum of industries is tricky, said Zhao, who did not participate in the town hall meeting but researches emerging economies, global strategy and innovation. But small farms are particularly vulnerable because of the volatility of the commodities markets. "It's harder for them to buffer the risk." Trump's confrontational plan on trade has resulted in a new version of the North American Free Trade Agreement that many experts say is similar to the old one. Trump has also turned his attention away from Europe, avoiding the mistake of getting into a harmful spat with allies needed to form a trading bloc and a unified front. Instead, Trump is focusing his trade war on China, which is seen as engaging in a wide range of unfair trade practices and industrial espionage. Three weeks ago, Trump slapped tariffs on $200 billion in Chinese imports, prompting China to respond with levies on $60 billion in American goods. The president has threatened to levy 25 percent tariffs on the remaining $257 billion of Chinese imports if Beijing refuses to eliminate trade and economic policies that Washington regards as discriminatory. The group that convened Thursday at the New Liberty Distillery in the city's Fishtown neighborhood was respectful of what the Trump administration was trying to accomplish, but believed that there's a better way to bolster American business without resorting to tariffs. "The level of uncertainty is now at an all-time high," said panelist Angela Marshall Hofmann, deputy director of Farmers for Free Trade, which organized the Thursday morning town hall and is co-chaired by former U.S. Senators Richard Lugar (R., Indiana) and Max Baucus (D., Montana). "And that's not just impacting farmers and ranchers, it's impacting manufacturers and retailers, too." Farmers for Free Trade has taken its free-trade message, a core GOP belief until recently, directly to the president, she said. It has run ads on Fox News in the Washington and Palm Beach media markets and signed on Lugar and Baucus to make their case. The administration's unpredictability is driving worries that the relatively strong U.S. economy will begin to falter. Those concerns were amplified by a stock market selloff that lopped more than 1,300 points off the Dow Jones average on Wednesday and Thursday. "The danger is a spiral of retaliation," said panelist Craig Snyder, the president and CEO of the World Affairs Council of Philadelphia. "The politics are being used to distort the very complex puzzle of trade." Thanks to Trump-imposed tariffs, Pennsylvanians are paying $45 million more a month for internationally sourced goods, according to data complied by consulting firm Trade Partnership and released by Tariffs Hurt the Heartland. On steel alone, the state spent an additional $98 million on "section 232 tariffs," primarily on steel from Russia, aluminum from Canada, rebar from Turkey, and forklift parts from China. Pennsylvania ranked fifth in the nation for paying steel tariffs. States reportedly paying more in steel tariffs are Texas ($389 million), Michigan ($139 million), California ($104 million) and Illinois ($103 million), according to the Trade Partnership data. A 10 percent tariff on picture frames was put into effect in September, said panelist Steve McGowan, vice president of operations at Easton's MCS Industries, a leading supplier of frames and wall décor to retailers. If tariffs rise to the expected 25 percent rate, a $5 frame will retail for $7.50, he said. "Business will go down," said McGowan. "So we've put expansion of our Easton distribution center on hold and it could be going away." Most of the levies have yet to kick in, Hofmann said. She expects tariffs on an additional $200 billion in goods to be imposed next year. "Continuing down this track will only lead to more layoffs and higher prices," she said. Distillers are worried because they have to set price points 12 months out, said panelist Robert Cassell, founder of Philadelphia's Millstone Group, which owns the New Liberty Distiller. "If our supply chain of local grain producers takes a hit and prices rise, we'll have to absorb those costs," he said. This article contains information from Inquirer wire services.